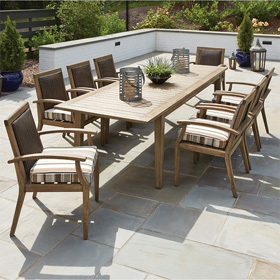 With a sleek design inspired by artistic New York, the Vale Patio Dining Set for 6 is the perfect addition to any modern dining area. This dining set seats four in dining chairs with full cushions and exposed backs. Two more can dine in swivel rocking dining chairs that have motion bases and fabric sleeves that cover up the frame on the backs and seats for a cleaner look. The centerpiece of this set is a spacious aluminum dining table that includes an umbrella hole for adding a source of shade. Frames in the Vale collection are made of high quality aluminum. Unlike other metals, aluminum will not rust making it the perfect choice for pools and coastal areas. Swivel Rockers 27.5"W x 31"D x 37.5"H 70 lbs. Arm Chairs 27.25"W x 30.25"D x 37.5"H 49 lbs. Table 42"W x 84"D x 29"H 115 lbs.